Basler will have two booths, one for machine vision products and one for embedded vision products and solutions. 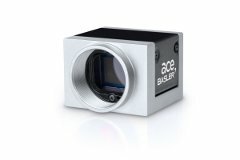 At booth 403, Basler will show the new Ace U models with the IMX287 and IMX273 sensors from Sony’s Pregius series. They offer high quality and high speed with 1.6 megapixel and VGA resolution, and are a convenient replacement for CCD sensors. The live demos will show new features of the Ace: the PGI for monochrome cameras includes denoising and improved sharpness, while the stacked ROI feature means the user can select multiple regions of interest. This increases the speed and reduces data load. At booth 917, the new Dart Bcon for MIPI camera will displayed, offering a combination of the MIPI CSI-2 interface with the GenICam standard. There will be two live demos, one of which showing face recognition.